Two months ago – yeesh, time flies – I hosted a fundraising brunch for an organization I have been involved with for three years. The org is focused on educational equity & opportunity and part of my role as a board member is to raise both awareness and funds. In true imperfect fashion, I’ve been “planning” this brunch in my head for (at least) over a year and finally made my move. I have developed an absolute love for hosting but have been making excuses (my place is too SMALL being the BIGGEST of the excuses) for a while. So, I decided to move away from second- and third-guessing myself and to click send on the invite and figure out the rest later. And, the fun began. 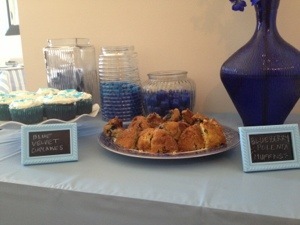 The brunch had a BLUE theme so everyone was asked to come dressed in their best blues and the decor tied in accordingly. 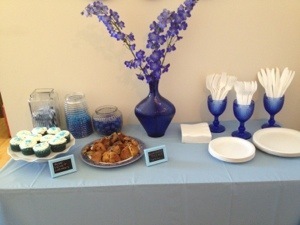 A color-themed concept is one of the simpler ways to keep a party cohesive and I had so much fun snatching up blue items and planning all the little details. In addition to some brunch basics, such as my sister’s famous spinach and sausage bread, we served some delish BLUEberry polenta muffins from Locanda Verde in TriBeCa and I whipped up some BLUE velvet cupcakes. Don’t worry, I did a trial the weekend before for maximum possibility for perfection! The day was not without its far-from-Martha moments, however. 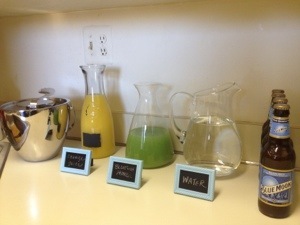 For one, our BLUE mimosa turned green and was immediately dubbed “BLUE-ish” mimosa. 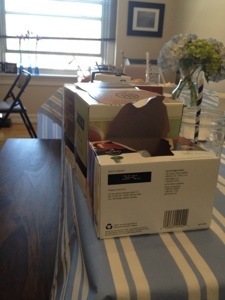 Additionally, when time came for coffee orders, I noticed every Keurig box under the sun appeared on my kitchen table and I QUICKLY learned the aesthetic benefit of those k-cup displays. 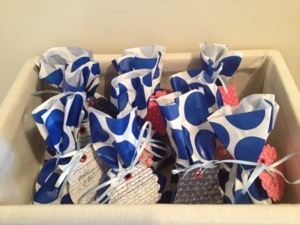 We capped off the afternoon with an inspirational video on the org and some favors to go (BLUE of course). All in all, the fundraiser was a success and I think everyone had a good time! 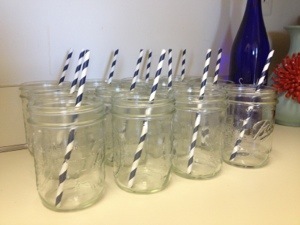 Now, I’m ready to up the ante… though, I just need to find a spot to store our new blue vases, placemats, and miscellaneous goodies – did I mention they are still (but neatly) sitting by the door?